Glyphosphate (aka Roundup) is a broad spectrum herbicide, meant to kill weeds. Unfortunately glyphosphate is a poison. It is ending up in our foods. In addition, Monsanto has been genetically modifying seeds (GMO seeds) so that the crops can withstand ever-higher levels of their chemicals without dying in the field. Whenever we write these articles, we usually have a group of angry (mostly Iowa farmers) flooding our FB post, proclaiming the necessity of using these poisons because it would be impossible to pull weeds on their 10,000 acre farms by hand. People are known to widely consume glyphosate residues in food – such as children’s breakfast cereal – but the health impact is controversial. In August a US court ordered Monsanto to pay $289m in damages after a jury ruled that the weedkiller caused a terminally ill man’s cancer. The company (Monsanto) filed papers to dismiss the case on 19 September. If you find this disturbing, take a trip with me underwater to the center of an extinct volcano at Santorini Island in Greece. During the 4 days of diving both inside and outside the cone, these grunts were the only fish observed. The dive leader was very excited to see any fish at all. 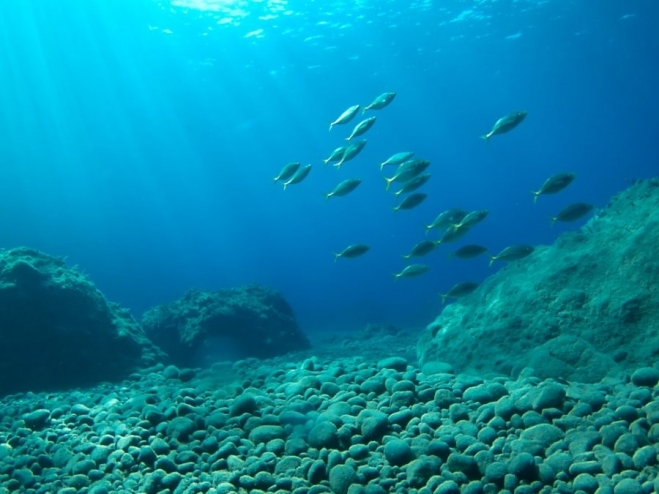 In this case, the cause was natural chemicals oozing up from the center of the volcano making the waters uninhabitable to all but the hardiest of fish. I worry that this is now occurring to bees due to man-made Monsanto chemicals applied to our land.